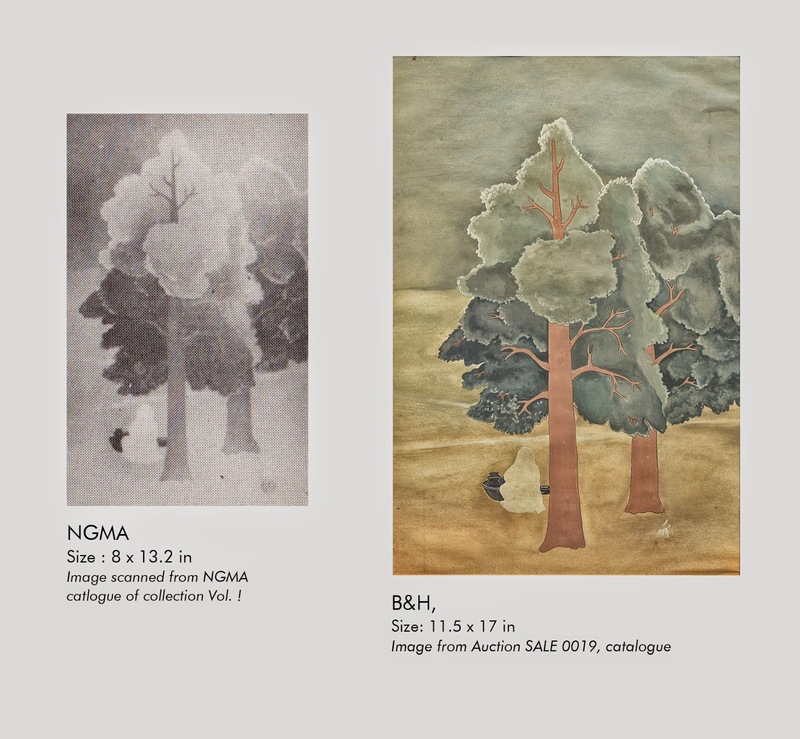 First, the work at the NGMA is not the “same” as the work in the Bid & Hammer catalogue – the work in the catalogue had a distinct colour palette and size difference (it was larger) and was without a monogram. Second, Nandalal Bose did not print a monogram on all his works. Third, it is very well known that not only Nandalal Bose but also many other artists including Raja Ravi Varma have painted versions of the same work. 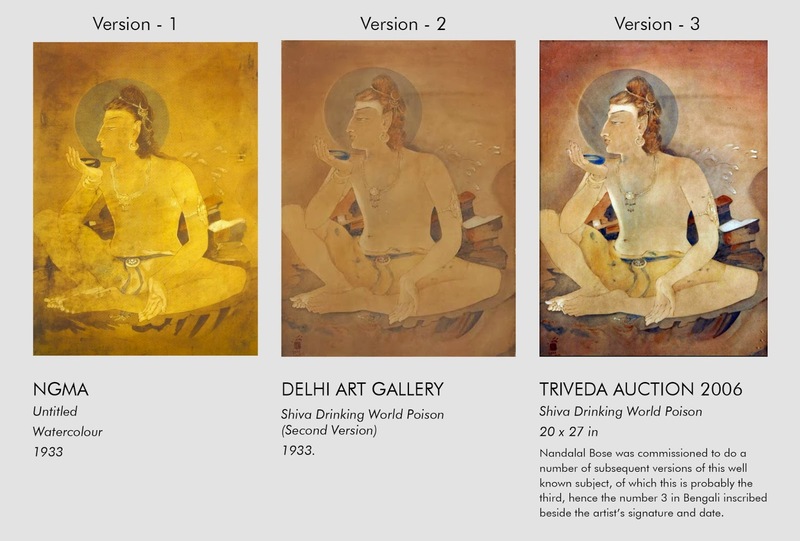 “Shiva drinking world poison” by Nandalal Bose had many versions one of which is in the NGMA. Fourth, if the work in the catalogue had to be a fake, it would have been an exact replica. "The auction will also offer ‘important works from the estate of Nandalal Bose,’ and it is one of the works of this eminent Bengal School artist that has now become the focus of a controversy. It has been said that the painting listed as being auctioned is similar to a painting, which is part of the Nandalal Bose collection at the National Gallery of Modern Art, New Delhi. The only difference being that the one being auctioned is in full colour while the painting at NGMA is in monochrome. I believe it is pertinent to mention here, that artists are known for doing a sketch first in monochrome and later, if they are happy with the outcome, to repeat the same subject in colour." "I have nothing, but disdain and huge aversion for fakes of any kind whatsoever but simply on the basis of assuming that an artist doesn’t usually replicate himself, can a painting be dubbed as fake? There have been so many occasions when artists have worked on a series that look very similar that it is difficult to tell one from the other. Many artists, including yours truly have done a work that has found favour with a buyer who wanted a bigger or smaller size and artists almost always oblige by creating a replica." Prof. Rajiv Lochan of NGMA who was quoted in the Indian Express article wrote an email to B&H with the following comments "I have never commented on the authenticity of the work which is in question as I have never seen it". He has also clarified that the work is not the "same" as reported. 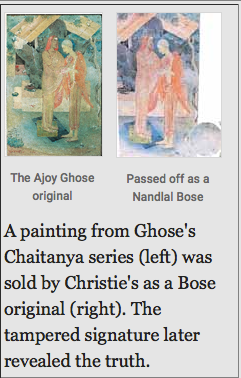 Even R. Sivakumar did not categorically state that the painting is fake as purported by the Indian Express article and told DNA that he would need to look at the work "more closely" while admitting that Nandalal Bose "did make versions of his own work". Without even seeing the work in B&H's catalogue and mis-representing the size of the images in the news article, the Indian Express newspaper delinquently sent out an impression that the journalist had actually compared the two works. This kind of blatant disregard for facts is testimony to how an unauthentic 'story' was passed off as an authentic piece of information. Not surprisingly, this article was published without our ratification, though diligent reporting norms would have mandated it in such instances. Coming as it was from an 'unknown source' it was clearly misleading and lacked veracity as 'several works sold at the Bid & Hammer auction', to well-known patrons of genuine art, as the audited results will vouch. To this date the results have not been made public as we would much rather have the perpetrators of this false publicity admit their irresponsibility and publish the truth, as the law will ensure in due course, in the greater interest of Indian art & reporting.